One striking detail for me is the absence of a home button in the image. This indicates that it is either in horizontal mode or that Apple is hinting at the removal of the control from the front of the next iPad. 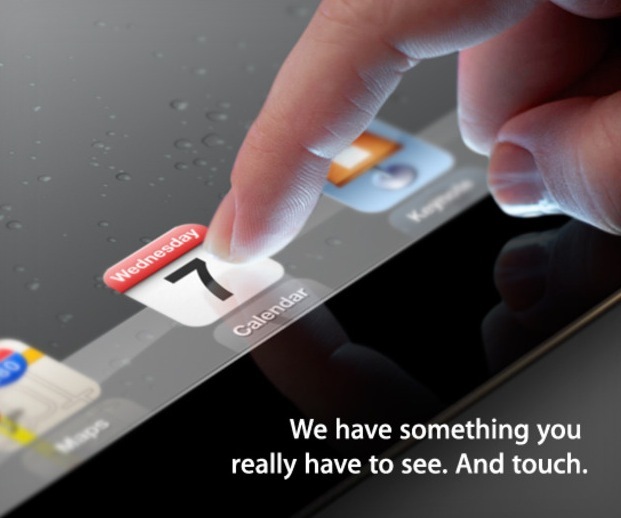 The iPad 3 has been heavily rumored to have a double-resolution Retina display, which is hinted at in the preview image, which appears to show a screen with higher resolution than the current iPad 2. Of course, this is just an illustration, and dissecting it is just a bit of the fun of these things and not to be taken too seriously. One detail that I thought was interesting was pointed out by Apple Spotlight, namely that the icons indicate that users should ‘go to’ the location on ‘this date’ for a ‘keynote’. Very nicely done. The new iPad model has been reported to feature the high-res display, a quad-core processor, LTE connectivity and more. Macrumors even got its hands on a panel it claims is the one that will ship in iPad 3s. The March 7th event date was correctly predicted by Rene Ritchie at iMore earlier this month. This should be an interesting event, as it is the first large product introduction after the passing of Apple founder Steve Jobs. The ‘voltron’ team of Phil Schiller, Scott Forstall and CEO Tim Cook will be presenting the first post-Jobs device to the world. We’ll bring you all of the details.